Most organizations know that talent management can be a valuablestrategy in maximizing business performance and ensuring business continuity. This concept of managing talent, however, is not new. But theviews as to who is responsible for managing talent and how it is getting accomplished are evolving.In the past, initiatives and programs related to talent were viewed asthe primary responsibility of the HR department. In today’s increasingly competitive and complex economy, organizations cannot take access totalent for granted. Forces (such as globalization and demographic shifts) have caused many organizations to become talent constrained due to shortages of headcount, managerial skills and critical technical skills. Such forces threaten an organization’s ability to grow and achieve its business targets. Now more than ever, organizations must integrate talent issues into the strategic business planning process. 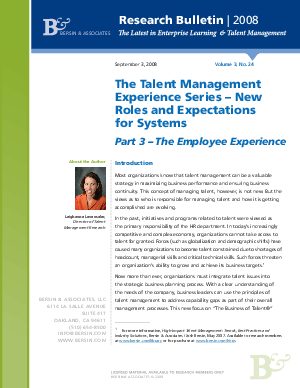 With a clear understanding of the needs of the company, business leaders can use the principles of talent management to address capability gaps as part of their overall management processes. This new focus on “The Business of Talent."